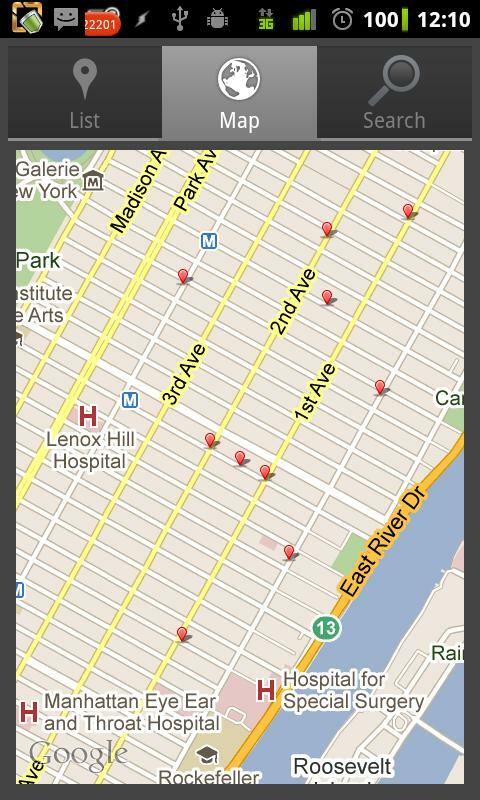 I just released version 1 of nyc health ratings for android. 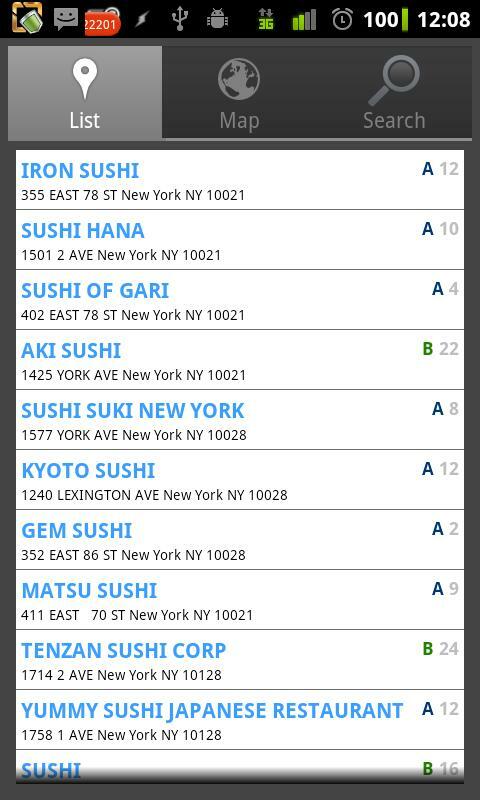 You can search for restaurants by name and location and get detailed inspection results just as you can on nychealthratings.com. Having this information available to you on a mobile device is so much more useful isn’t it. One really nice feature is that searches default to your current network location, which works for the majority of searches. 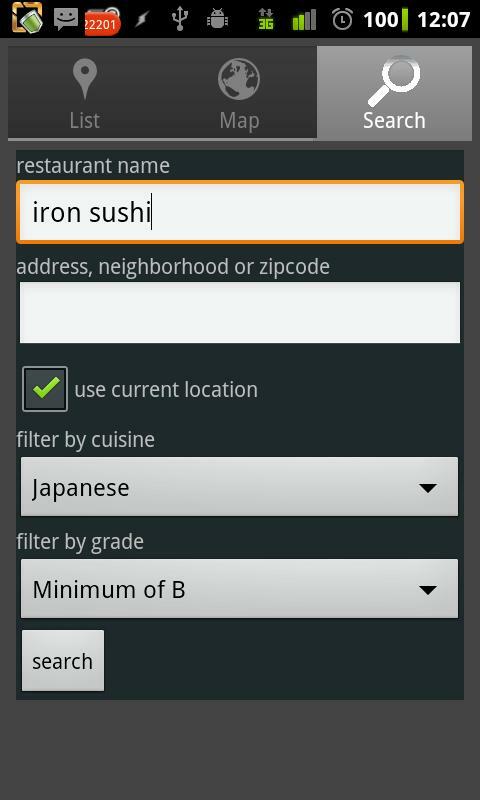 If you are searching for a restaurant that isn’t in the immediate vicinity just input the zip code, address, or neighborhood name. In addition to the android market it is also available on amazons market. Now that I’ve finished version 1 for Android, I’m going to start building an iphone version. My biggest gripe about Perl has always been the lack of functional prototypes and method signatures. The concept of method signatures is not a revolution it’s been around forever, almost every programming language I can think of off the top of my head has it in some form. Having to unpack @_ time and time again is just such a waste of keystrokes. Not only that there are multiple ways to do something so basic. (Shift, copy the list to lexical vars, direct access in $_[i] etc). It’s surely been the source of a number of bugs and something every Perl programmer needs to be conscious of. My main argument for method signatures is it reduces bugs and it documents your code without having to write documentation. Its declarative, it does what it says and says what it does. Plain and simple no guessing. As most Perl programmers are aware Devel::Declare is a module that has added the ability to extend Perl 5 the language without source filters. There are several really cool modules that have been developed on top of Devel::Declare. MooseX::Declare and MooseX::Method::Signatures and Method::Signatures in particular. The first MooseX::Method::Signatures, comes bundled as part of MooseX::Declare. MooseX::Declare adds declarative class and method keywords on top of Moose. MooseX::Method::Signatures has it’s own type system and does optional run time type checking on arguments much like you would do with Params::Validate except with a declarative syntax. It’s down right beautiful and makes you warm and fuzzy inside to use it, the down side is there is a huge performance penalty to use MooseX::Method::Signatures at run time. Depending on what you are doing it might not matter much. The module Method::Signatures gives you 95% of the sugar and 100 x performance over MooseX::Method::Signatures. Type checking at run time is something that I usually don’t need (This is still Perl, I swear). Positional and named parameters are both supported along with defaults and constraints. On my latest project I’ve been using Moose along with Method::Signatures and I couldn’t be any happier. Take a look at the performance benchmarks I’ve included comparing these two modules along with regular ‘sub’ methods. # are not constant-folded away. Although I'm not sure perl will do that. These tests are not exhaustive nor do they need to be. Its clear that even with no arguments subs and Method::Signatures are on order of 100 times faster than MooseX::Method::Signatures. What really surprised me here is that Method::Signatures looks to be faster than subs. It would be an interesting test to benchmark the number and types of arguments. Bottom line is I will use Method::Signatures and Moose in any new projects I write in Perl. I’ve been successfully running production code with Method::Signatures since September with no problems. Hoping to get some feed back on how Method::Signatures could possibly be faster than subs. When did soap and perl become so difficult. Using it as a server is a complete pain. SOAP::Lite was cutting edge 5 years ago. Its just a bit behind with the evolving wsdl standards. So I decided to use XML-RPC, its all I really need and interopability with other languages should be simpler. This is the main reason why I’m using web services to begin with. Speaking of the XML RPC cpan modules. RPC::XML works well but the documentation is lacking. You have to putz around to get anything to work. add_method() is especially poorly documented. Much guessing and the perl debugger helped me get the syntax correct:) It would be great if there was Apache2 integration … But I shouldn’t complain it actually works and works well.